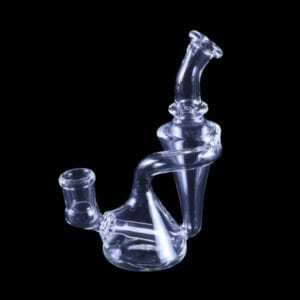 Glass Nation carries the best selection of recycler dab rigs online. Recycler dab rigs are a feature that is incorporated into dab rigs, bongs, banger hangers, as well as water tubes. They tend to be most associated with oil rigs and banger hangers. Recyclers have an upside down conical shape that causes the smoke and water to rotate. This action creates diffusion, which acts to filter the smoke. The recycler sometimes looks like a tank attached to the base of the oil rig. They are essentially overflow takes that fill up when smoke in inhaled though the mouth piece. Then subsequently swirl the smoke and air due to the water returning to the base after inhalation.